Three controversial bypasses failed to reduce traffic to the levels promised, a study by green groups has found. Researchers looked at the A27 Polegate bypass in East Sussex, the A34 Newbury bypass, Berkshire, and the M65 Blackburn Southern bypass, Lancashire. The Countryside Agency and the Campaign to Protect Rural England (CPRE) found traffic on the bypasses was growing faster than forecast by the government. Transport Minister Stephen Ladyman said other factors were to blame. "Many of the effects that are reported in this study are not as the result of the road development itself, but are the result of other developments that have followed behind the road developments," Mr Ladyman said. "So if we decide to build an industrial park for example near a new road then you can hardly be surprised if that industrial park generates new traffic." Researchers also said the bypass schemes caused permanent damage to rural landscapes. Their study, published on Monday, said traffic on the three bypasses had already reached or exceeded the levels forecast for the year 2010. And extra traffic, over and above the gradual increase happening everywhere, had flowed on to local roads. At Newbury and Polegate, the new bypasses did reduce town centre traffic. 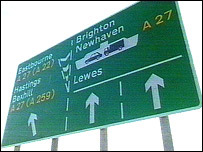 But in Polegate, shop owners suffering from losses in trade had actually been campaigning for signs to be installed on the bypass directing traffic back into town. In Newbury, most of the freed-up space on the old bypassed road was being taken up by traffic attracted by new development, the study said. The environmental groups said the government was failing to learn lessons from the schemes so they could be avoided in future. "New roads damage the countryside and the wider environment," said CPRE chief executive Shaun Spiers. "They blight favourite views and their noise can carry for miles. "We must learn from past mistakes, but so far as road building is concerned this study shows we're continuing to repeat them." Graham Garbutt, chief executive of the Countryside Agency, said: "We need to be sure that the effects of building new roads over the countryside are fully understood, learning from schemes already built and using the lessons."